“Listo? Uno! Dos! TRES!” Chimbe yelled out and together the dive team back rolled off the sides of the zodiac, catching a fleeting upside-down glimpse of spectacular Darwin’s Arch before we plunged into the crisp blue water of the Eastern Tropical Pacific. Immediately, we were surrounded by a visual cacophony of fish, mostly creole wrasse and jacks of various types. But there wasn’t time to absorb that in the moment. We had to get to the bottom quick, or risk being swept off towards the open sea by the strong and unpredictable currents that swirl around the Arch, as they do around most of the Galapagos Islands. We made the bottom in seconds, briefly scattering barberfish and passer angelfish as we took up positions on our preferred rocks at the edge of the drop-off. And then we waited. While we waited, there was much to absorb. So much, in fact, that it could be hard to know where to look. Dusky red creole wrasse (Paranthias colonus) formed a “wall of mouths” just out into the blue. Tens of thousands of them hung in mid-water, busily picking plankton from the rich waters passing by. Occasionally they all rushed to the bottom with an audible “woosh,” a sure sign that some big predator, usually a huge menacing yellowfin tuna, was about to pass by. A spectacular diversity of fish swarmed among and over the rocks: goatfish, grunts, snapper, leopard flounder (Bothus leopardinus), puffers and one of the biggest hawkfish (Cirrhitus rivulatus) I had ever seen. Morays were everywhere, and harems of little female rainbow wrasses (Thalassoma lucasanum) regularly rushed up into the water column to spawn, shepherded by “supermales” twice their size. Schools of bigeye and cottonmouth jacks hung above the rocky reef, so abundant that they literally blocked out the light. But no whale sharks. Not today. Not that sharks are absent from Darwin’s Arch; quite the opposite! Every dive included at least dozens, and often hundreds of scalloped hammerhead sharks. Sometimes they hung out in the blue, tantalizingly close to the edge of visibility. 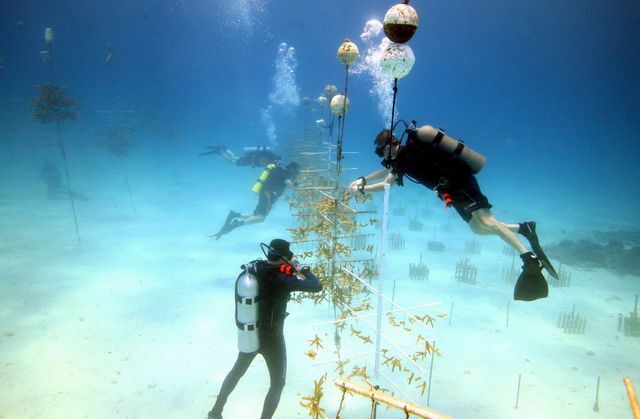 Other times they came in over the reef seeking a cleaning from symbiotic hogfish, barberfish and passer angels. If you hugged a rock just right and sipped your air quietly, they might just pass right by above your head, a once in a lifetime thrill. They were mostly females, and mostly disfigured by mating scars from persistent males, somewhere unseen. Every now and then if you looked up, they streamed overhead like a flock of birds, migrating in glorious silhouette. Large Galapagos sharks were also there, patrolling the reef in regular patterns, and silky and blacktip sharks hung under the boat and were our frequent companions on SCUBA safety stops at 15 feet. And still, no whale sharks. It became one of those frustrating turns familiar moments that happen to field biologists from time to time. We had come a long way and invested a lot of effort in preparation, but nature was not cooperating. We ended up with zero samples. Maddening though it was, there’s not much that could be done. For the whole time at Darwin’s Arch, we saw just two whale sharks. A big female that we were able to approach briefly but not sample, and a smaller animal we saw twice but couldn’t get close to. Perhaps the season ended early, perhaps we were just unlucky. But for whatever reason, it wasn’t happening for us that time. 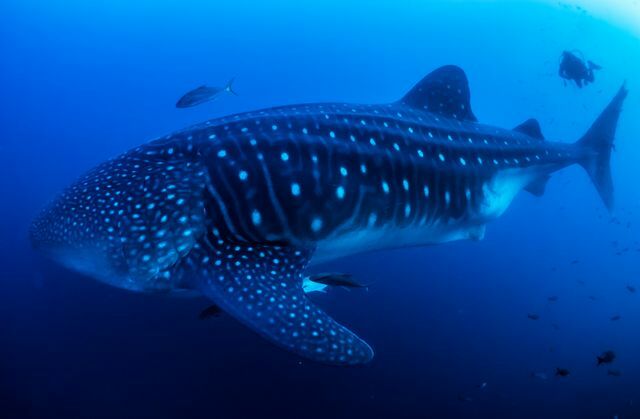 Whale sharks, it seems, will hold on to the secrets of their reproductive cycle for one more season. On the other hand, if you’re going to miss out, Darwin’s Arch is a pretty amazing place to do it. 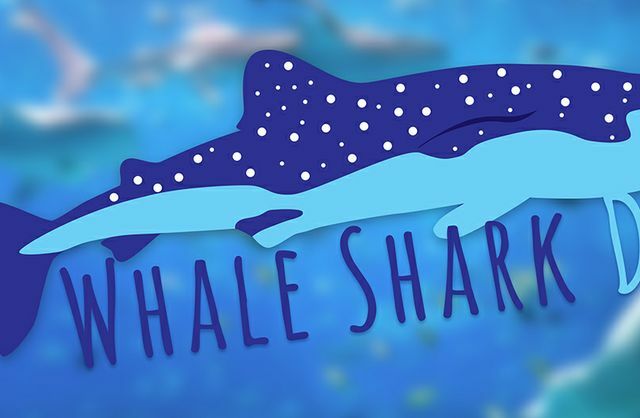 For more information on our whale shark research and conservation efforts, visit http://www.georgiaaquarium.org/conserve/research/whale-sharks.